Today we are going to do something different. Suggested by Mrs. Claus, we are going to do a Blog Hop of all of your amazing creative gifts you have made (remember reduce, reuse, recycle). Don't forget to sign up for the Blog Hop and paste the code on your blog, and hop along!!! Wow.... I really like your blog and I love the idea of paying it forward friday. I'm following you per the joy of giving birth. Stop by and visit me at healthy living and a balanced you-empowering momspiration. www.aliciahunter.net. Have a Great Week! I don't have anything to share, but I'm stopping by from the Joy of Giving Birth. Have a good weekend! 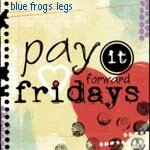 This is my kinda pay it forward friday! I want to do this with all my neighborhood childrens! I'm going to tell my sister that works at a boys and girls club to do this. Thanks Kelly, you're always fun! Aw shucks, Suzie Q!!! I am surrounded by amazing people here, including yourself.